The first records on supernova 1006 go back to Chinese astronomers, who observed a very bright new object on May 1, 1006, most likely the brightest supernova in human history (see APOD 2006). Non-thermal synchrotron X-rays from the rim of the 30 arc-minute shell (Fig. 1), first discovered by ASCA (Koyama et al. 1995), indicate the presence of high-energy electrons accelerated in the supernova shock front and made the object a prime target for observations with Cherenkov telescopes. Detection of TeV gamma rays from SN 1006 was initially reported by the CANGAROO I and II instruments (Tanimori et al. 1988, Hara et al. 2001) at a flux level of 1/2 to 1/3 of the Crab flux, making this the first detection of a shell-type remnant. SN 1006 was therefore also among the first targets of the H.E.S.S. telescopes in 2003 in 2004. Despite the more sensitive instrument, H.E.S.S. did not detect a source and could only derive upper flux limits (Aharonian et al. 2005), an order of magnitude below the flux level given by CANGAROO. Observations with the improved CANGAROO III telescope system (Tanimori et al. 2005, Enomoto 2008) confirmed these H.E.S.S. results, a plausible explanation being that in some of the original CANGAROO I,II single-telescope analyses, systematic effects arising from calibration problems were underestimated (e.g. Itoh et al. 2006). It was soon realized that the non-detection of SN 1006 does not necessarily not lead to contradictions with the hypothesis of acceleration of high-energy particles in the shock (Ksenofontov et al. 2005): the gas density in SN 1006 is quite low, about 0.05 particles/ccm (Acero et al. 2007), and accelerated nuclei simply do not find enough targets to produce gamma rays. Furthermore, assuming a magnetic field in the remnant of 30 microgauss or higher, the number of electrons required to generate the synchrotron X-rays is sufficiently low that the gamma ray flux due to Inverse Compton scattering would (just) be below detection threshold . The narrowness of the X-ray rims was indeed interpreted as evidence for relatively large fields in the remnant (Berezhko et al. 2003). However, with increasing sensitivity of the instruments, it was clear that SN 1006 should ultimately be visible as a source of very high energy gamma rays. In 103 h of data accumulated over the years 2003 to 2008, H.E.S.S. finally detected a gamma-ray excess (Fig. 2), with a flux level well below any previous upper limit. Using the pre-defined search region from the upper-limit paper (Aharonian et al. 2005), the signal from the north-east rim was detected with a significance of over 5 sigma. A second gamma-ray excess appears in the south-west corner of the remnant. The morphology of the VHE gamma ray source is quite similar to the X-ray source, as is evident when a Chandra X-ray image is smeared according to the angular resolution of H.E.S.S. (Fig. 3). 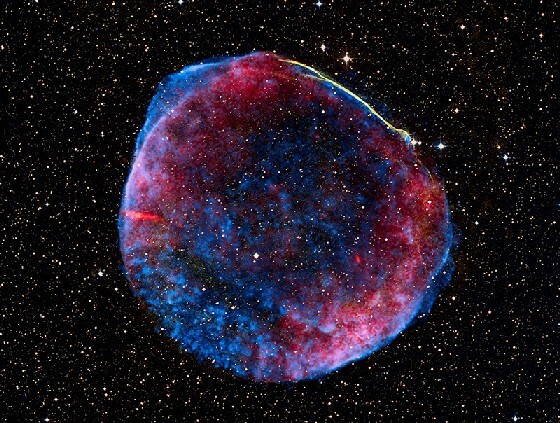 The morphology of SN 1006 and X-rays and gamma rays can be explained as due to the interstellar magnetic field threading the remnant from north-east to south-west, inhibiting efficient particle acceleration in regions where the field is parallel to the supernova shock front. "Discovery of SN 1006 in Very High Energy Gamma Rays with H.E.S.S. ", Melitta Naumann-Godo et al., H.E.S.S. collaboration, to appear in Proceedings of the Heidelberg International Symposium on Gamma-Ray Astronomy, 2008. Fig. 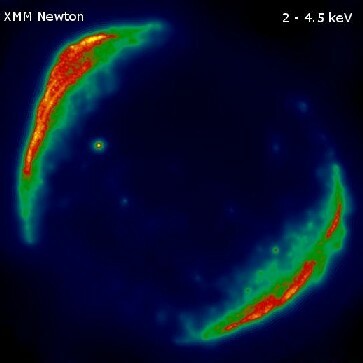 1: XMM Newton image of SN1006 in the 2 to 4.5 keV X-ray band, showing the non-thermal emission from the rim of the remnant. Fig. 2: Gamma-ray map of the region of SN 1006, based on 103 h of H.E.S.S. data. The circle indicates position and size of SN 1006 as given in Green's Catalog. Fig. 3: Exposure-corrected Chandra X-ray map of SN 1006, smeared to match the resolution of the H.E.S.S. telescopes.